Making real estate decisions based on emotion and gut instinct can greatly increase the risk of negative outcomes. Anyone making a real estate decision can be more successful if they understand how market data affects the current and future direction of the market. The metric to measure supply (inventory) and demand is the absorption rate. The absorption rate is a measure of how long it would take to sell all of the homes currently on the market, based on how many homes sold in the past year. If the absorption rate increases this is an indication that inventory is increasing and that values have peaked. If the absorption rate decreases this indicates that demand is increasing and that values should increase further. Historically supply and demand in this market are balanced with a 6 month absorption rate. 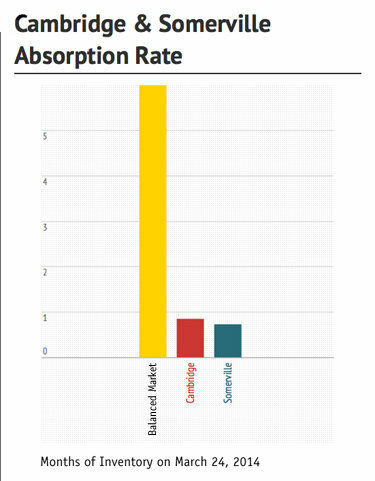 The absorption rate in Cambridge and Somerville is less than one month. Current market conditions are strongly in favor of sellers. The lack of inventory and strong demand indicate that the market is in the midst of an appreciation cycle. 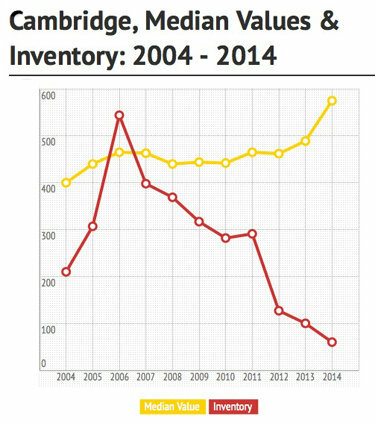 This analysis of the past 10 years comparing inventory to median values clearly shows that as inventory has decreased values have increased. Values are in thousands. Property types are single family, condo, and multifamily. All data from MLS PIN. 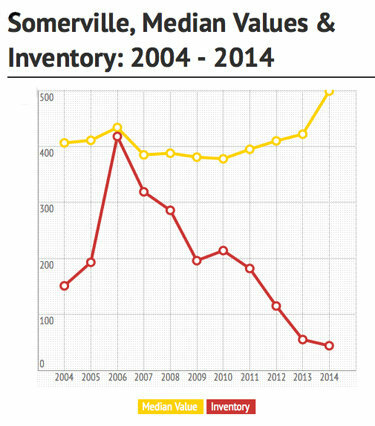 Somerville's inventory and median value trends are nearly identical to Cambridge.